For the U.S. Navy sailor and Medal of Honor recipient, see Oscar V. Peterson. For the American carver of fish decoys, see Oscar W. Peterson. Oscar Emmanuel Peterson, CC CQ OOnt (August 15, 1925 – December 23, 2007) was a Canadian jazz pianist and composer. He was called the "Maharaja of the keyboard" by Duke Ellington, but simply "O.P." by his friends. He released over 200 recordings, won eight Grammy Awards, and received numerous other awards and honours. He is considered one of the greatest jazz pianists, and played thousands of concerts worldwide in a career lasting more than 60 years. Peterson was born in Montreal, Quebec, to immigrants from the West Indies; his father worked as a porter for Canadian Pacific Railway. Peterson grew up in the neighbourhood of Little Burgundy in Montreal. It was in this predominantly black neighborhood that he encountered the jazz culture. At the age of five, Peterson began honing his skills on trumpet and piano, but a bout of tuberculosis when he was seven prevented him from playing the trumpet again, so he directed all his attention to the piano. His father, Daniel Peterson, an amateur trumpeter and pianist, was one of his first music teachers, and his sister Daisy taught him classical piano. Peterson was persistent at practising scales and classical études. As a child, Peterson studied with Hungarian-born pianist Paul de Marky, a student of István Thomán, who was himself a pupil of Franz Liszt, so his early training was predominantly based on classical piano. But he was captivated by traditional jazz and boogie-woogie and learned several ragtime pieces. He was called "the Brown Bomber of the Boogie-Woogie". At the age of nine Peterson played piano with a degree of control that impressed professional musicians. For many years his piano studies included four to six hours of daily practice. Only in his later years did he decrease his practice to one or two hours daily. In 1940, at fourteen years of age, he won the national music competition organized by the Canadian Broadcasting Corporation. After that victory, he dropped out of the High School of Montreal, where he played in a band with Maynard Ferguson. He became a professional pianist, starring in a weekly radio show and playing at hotels and music halls. In his teens he was a member of the Johnny Holmes Orchestra. From 1945 to 1949 he worked in a trio and recorded for Victor Records. He gravitated toward boogie-woogie and swing with a particular fondness for Nat King Cole and Teddy Wilson. By the time he was in his 20s, he had developed a reputation as a technically brilliant and melodically inventive pianist. In a cab on the way to the Montreal airport, Norman Granz heard a radio program broadcasting from a local club. He was so impressed that he told the driver to take him to the club so he could meet the pianist. In 1949 he introduced Peterson in New York City at a Jazz at the Philharmonic concert at Carnegie Hall. He remained Peterson's manager for most of his career. This was more than a managerial relationship; Peterson praised Granz for standing up for him and other black jazz musicians in the segregationist south of the 1950s and 1960s. In the documentary video Music in the Key of Oscar, Peterson tells how Granz stood up to a gun-toting southern policeman who wanted to stop the trio from using "whites-only" taxis. In 1950 Peterson worked in a duo with double bassist Ray Brown. Two years later they added guitarist Barney Kessel. Then Herb Ellis stepped in after Kessel grew weary of touring. The trio remained together from 1953 to 1958, often touring with Jazz at the Philharmonic. 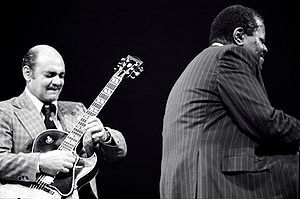 Peterson also worked in a duo with Sam Jones, Niels-Henning Ørsted Pedersen, Joe Pass, Irving Ashby, Count Basie, and Herbie Hancock. He considered the trio with Brown and Ellis "the most stimulating" and productive setting for public performances and studio recordings. In the early 1950s, he began performing with Brown and drummer Charlie Smith as the Oscar Peterson Trio. Shortly afterward Smith was replaced by guitarist Irving Ashby, who had been a member of the Nat King Cole Trio. Ashby, who was a swing guitarist, was soon replaced by Kessel. Their last recording, On the Town with the Oscar Peterson Trio, recorded live at the Town Tavern in Toronto, captured a remarkable degree of emotional as well as musical understanding between three players. When Ellis departed in 1958, they hired drummer Ed Thigpen because they felt no guitarist could compare to Ellis. Brown and Thigpen worked with Peterson on his albums Night Train and Canadiana Suite. Both left in 1965 and were replaced by bassist Sam Jones and drummer Louis Hayes (and later, drummer Bobby Durham). The trio performed together until 1970. In 1969 Peterson recorded Motions and Emotions with orchestral arrangements of "Yesterday" and "Eleanor Rigby" by The Beatles. In the fall of 1970, Peterson's trio released the album Tristeza on Piano. Jones and Durham left in 1970. In the 1970s Peterson formed a trio with guitarist Joe Pass and bassist Niels-Henning Ørsted Pedersen. This trio emulated the success of the 1950s trio with Brown and Ellis and gave acclaimed performances at festivals. Their album The Trio won the 1974 Grammy Award for Best Jazz Performance by a Group. On April 22, 1978, Peterson performed in the interval act for the Eurovision Song Contest 1978 that was broadcast live from the Palais des congrès de Paris. In 1974 he added British drummer Martin Drew. This quartet toured and recorded extensively worldwide. Pass said in a 1976 interview, "The only guys I've heard who come close to total mastery of their instruments are Art Tatum and Peterson". Peterson was open to experimental collaborations with jazz musicians such as saxophonist Ben Webster, trumpeter Clark Terry, and vibraphonist Milt Jackson. In 1961, the Peterson trio with Jackson recorded the album Very Tall. His solo recordings were rare until Exclusively for My Friends (MPS), a series of albums that were his response to pianists such as Bill Evans and McCoy Tyner. He recorded for Pablo, led by Norman Granz, after the label was founded in 1973. In the 1980s he played in a duo with pianist Herbie Hancock. In the late 1980s and 1990s, after a stroke, he made performances and recordings with his protégé Benny Green. In the 1990s and 2000s he recorded several albums accompanied by a combo for Telarc. Peterson had arthritis since his youth, and in later years he had trouble buttoning his shirt. Never slender, his weight increased to 125 kg (276 lb), hindering his mobility. He had hip replacement surgery in the early 1990s. Although the surgery was successful, his mobility was still inhibited. In 1993 a stroke weakened his left side and removed him from work for two years. During the same year incoming prime minister Jean Chrétien, his friend and fan, offered him the position of Lieutenant-Governor of Ontario. According to Chrétien, Peterson declined the job due to ill health related to the stroke. Although he recovered some dexterity in his left hand, his piano playing was diminished, and his style had relied principally on his right hand. In 1995 he returned to occasional public performances and recorded for Telarc. In 1997 he received the Grammy Lifetime Achievement Award and an International Jazz Hall of Fame Award. His friend, Canadian politician and amateur pianist Bob Rae, said, "a one-handed Oscar was better than just about anyone with two hands." In 2003, Peterson recorded the DVD A Night in Vienna for Verve with Niels-Henning Ørsted Pedersen, Ulf Wakenius, and Martin Drew. He continued to tour the U.S. and Europe, though at most one month a year, with rest between concerts. In 2007 his health declined. He canceled his plans to perform at the Toronto Jazz Festival and a Carnegie Hall all-star concert that was to be given in his honour. Peterson died on December 23, 2007 of kidney failure at his home in Mississauga, Ontario. Peterson was married four times. He smoked cigarettes and a pipe and often tried to break the habit, but every time he stopped he gained weight. He loved to cook and remained a large man throughout his life. Peterson taught piano and improvisation in Canada, mainly in Toronto. With associates, he started and headed the Advanced School of Contemporary Music in Toronto for five years during the 1960s, but it closed because touring called him and his associates away, and it did not have government funding. Later, he mentored the York University jazz program and was the Chancellor of the university for several years in the early 1990s. He published jazz piano etudes for practice. He asked his students to study the music of Johann Sebastian Bach, especially The Well-Tempered Clavier, the Goldberg Variations, and The Art of Fugue, considering these piano pieces essential for every serious pianist. Among his students were pianists Benny Green and Oliver Jones. He was influenced by Teddy Wilson, Nat King Cole, James P. Johnson, and Art Tatum, to whom many compared Peterson in later years  After his father played a record of Tatum's "Tiger Rag", he was intimidated and disillusioned, quitting the piano for several weeks. "Tatum scared me to death," he said, and was "never cocky again" about his ability at the piano. Tatum was a model for Peterson's musicianship during the 1940s and 1950s. Tatum and Peterson became good friends, although Peterson was always shy about being compared with Tatum and rarely played the piano in Tatum's presence. Peterson also credited his sister—a piano teacher in Montreal who also taught several other Canadian jazz musicians—with being an important teacher and influence on his career. Under his sister's tutelage, Peterson expanded into classical piano training and broadened his range while mastering the core classical pianism from scales to preludes and fugues by Johann Sebastian Bach. Building on Tatum's pianism and aesthetics, Peterson also absorbed Tatum's musical influences, notably from piano concertos by Sergei Rachmaninoff. Rachmaninoff's harmonizations, as well as direct quotations from his 2nd Piano Concerto, are scattered throughout many recordings by Peterson, including his work with the most familiar formulation of the Oscar Peterson Trio, with bassist Ray Brown and guitarist Herb Ellis. During the 1960s and 1970s Peterson made numerous trio recordings highlighting his piano performances; they reveal more of his eclectic style, absorbing influences from various genres of jazz, popular, and classical music. According to pianist and educator Mark Eisenman, some of Peterson's best playing was as an understated accompanist to singer Ella Fitzgerald and trumpeter Roy Eldridge. Bösendorfer pianos - 1990s and 2000s, some performances from the 70s onward. Steinway & Sons Model A (which currently resides at Village Studios in Hollywood) - most performances from the 1940s through the 1980s, some recordings. Baldwin pianos - some performances in the USA, some recordings. C. Bechstein Pianofortefabrik pianos - some performances and recordings in Europe. Petrof pianos - some performances in Europe. Fender Rhodes electric piano - several recordings. Hammond organ - some live performances and several recordings. Vocals - some live performances and several recordings. ^ Remarks by Herbie Hancock, Quincy Jones and Bob Rae, Oscar Peterson Tribute - Simply The Best. Concerts On Demand. CBC Radio Two (January 12, 2008). Retrieved on January 13, 2008. ^ Severo, Richard (October 20, 2010). "Oscar Peterson: 1925-2007 / Virtuoso pianist - among jazz world's giants". The San Francisco Chronicle. ^ "Obituaries: Oscar Peterson". The Daily Telegraph. London. 26 December 2007. Retrieved February 6, 2011. ^ Michelot, Pabli. "Le Jazz d’Oscar Peterson". L'Encre Noir, February 8, 2017. ^ "Little Burgundy". McGill University. Retrieved December 25, 2007. ^ a b J. D. Considine (December 26, 2007). "King of the keys made jazz a pleasure". The Globe and Mail. Toronto. Archived from the original on December 26, 2007. Retrieved January 12, 2008. ^ a b c Yanow, Scott. "Oscar Peterson". AllMusic. Retrieved 14 August 2018. ^ John Chilton (5 August 2002). Roy Eldridge, Little Jazz Giant. Bloomsbury Academic. ISBN 978-0-8264-5692-2. ^ "Peterson, Oscar". doi:10.1093/gmo/9781561592630.article.j352400. Retrieved 2018-01-15. ^ "Basie, Count". doi:10.1093/gmo/9781561592630.article.a2240170. Retrieved 2018-01-15. ^ King, Betty Nygaard. "Oscar Peterson". The Canadian Encyclopedia. Retrieved 2018-01-15. ^ "A look at Oscar Peterson's career:". oscarpeterson.com. Archived from the original on April 28, 2007. Retrieved May 23, 2007. ^ Nat Hentoff. Co-editor, The Jazz Review. ^ Yanow, Scott (2000). Bebop. Miller Freeman. pp. 333–. ISBN 978-0-87930-608-3. Retrieved 14 August 2018. ^ "Peterson, Oscar". MusicWeb Encyclopaedia of Popular Music. Archived from the original on May 22, 2006. Retrieved December 25, 2007. ^ Alexander Panetta. "Chrétien calls Peterson 'most famous Canadian', says Mandela was moved to meet him". CANOE. The Canadian Press. Archived from the original on December 26, 2007. Retrieved December 26, 2007. ^ "Oscar Peterson Tribute - Simply The Best". Concerts On Demand. CBC Radio Two. January 12, 2008. Archived from the original on January 15, 2008. Retrieved January 13, 2008. ^ "Canadian jazz great Oscar Peterson dies". CBC News. December 24, 2007. Retrieved December 24, 2007. ^ Levine, Doug (December 27, 2007). "Jazz World Mourns Oscar Peterson". VOA News. Voice of America. Archived from the original on January 29, 2009. Retrieved December 27, 2008. ^ Voce, Steve (26 December 2007). "Oscar Peterson: Virtuoso pianist who dominated jazz piano in the". The Independent. Retrieved 15 August 2018. ^ "Oscar Peterson Biography - Challenged by Tatum Disc, Founded School in Toronto, Suffered Stroke, Selected works". biography.jrank.org. Retrieved 20 January 2018. ^ Batten, Jack (11 September 2012). "Oscar Peterson: The Man and His Jazz". Tundra. Retrieved 20 January 2018 – via Google Books. ^ Al Levy (21 November 2004). "Oscar Peterson". alevy.com. Retrieved 2008-01-12. ^ "'I don't think we'll ever see another Oscar Peterson': Oliver Jones". CBC News. January 11, 2008. Retrieved January 12, 2008. ^ "YFile » Ron Westray appointed as Oscar Peterson Chair". yfile-archive.news.yorku.ca. 24 September 2009. Retrieved 14 August 2018. ^ "Several of jazz world's top names to honour Oscar Peterson at free concert". The Canadian Press. January 12, 2008. Archived from the original on December 31, 2007. Retrieved January 12, 2008. ^ Don Heckman (December 25, 2007). "Oscar Peterson, 82; pianist dazzled jazz world with technique, creativity". Los Angeles Times. Archived from the original on December 28, 2007. Retrieved January 12, 2008. ^ William R Cunningham and Sylvia Sweeney, In the Key of Oscar, National Film Board of Canada, 1992. ^ Shsante Infantry (December 26, 2007). "Oscar Peterson, 82: Jazz giant". The Toronto Star. Retrieved January 12, 2008. ^ a b "Oscar Peterson: Montreal-born pianist is an unofficial Canadian ambassador". concordia.ca. Retrieved 14 August 2018. ^ "Oscar Peterson concert hall". Concordia University. Retrieved January 28, 2007. ^ "2008 SOCAN Awards". www.socan.ca. Retrieved 20 January 2018. ^ "Legendary Jazz Pianist to Receive City's Highest Award", Mississauga – Newsroom, September 8, 2003. ^ ""Celebrate the Jazz" - Oscar Peterson Public School Official Opening". York Region District School Board. Archived from the original on April 27, 2009. Retrieved November 3, 2009. ^ Martin Knelman (June 29, 2010). "Knelman: Oscar Peterson's piano lives on in Ottawa". Toronto Star. Retrieved 15 August 2015. 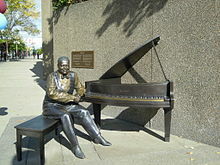 ^ "Oscar Peterson sculpture awaits Queen's hand". CBC News. June 16, 2010. Retrieved September 29, 2010. ^ "Honorary Degree Citation". archives.concordia.ca. Retrieved 2016-04-11. ^ King, Betty Nygaard. "Oscar Peterson". The Canadian Encyclopedia. Retrieved 2017-02-28. Wikimedia Commons has media related to Oscar Peterson.